Its receivers, speakers and Blu-ray players have all been given an update, but prices have stayed more than reasonable – with nothing announced creeping above the £400 mark. First up is the company's TX range of receivers. The entire range is equipped with handling HD audio codecs, such as Dolby TrueHD and DTS-HD Master Audio, and the flagship model (TX-SR608) is also THX certified. The SR608 is a 7.1 setup, offering seven x 160 watts power output, HDMI 1.4 connectivity (for 3D-enabled TVs, something that is on all the range) and is the first in its class to be given THX's Select 2 status. The SR608 can also cope with Dolby Pro Logic IIz and now Audyssey DSX, and comes with five rear-mounted HDMI inputs and one at the front. Other models released include the TX-SR508, which is also a 7.1 system, but with seven x 130 watts output, and the TX-SR308 which is a 5.1 setup, which outputs at 100 watts. When it comes to home cinema systems, Onkyo is releasing the HTX-22HDX and an optional add-on, the SKS-22SX speaker package. The 22HDX is a 2.1 setup comprising Dolby TrueHD and DTS-HD Master Audio encoding, four dedicated game modes (Rock, Sports, Action and RPG) and the addition of HDMI 1.4 to make it 3D Ready. There's also one coaxial and two optical outputs and the system can be upgraded to 5.1 if you so wish. This is where the 22SX speaker package comes in. Purchase this and you get a centre and two surround sound speakers to beef up the sound. For those who want 5.1 surround setups without the fuss of adding upgrades, Onkyo is also offering the HT-S6305, HT-S5305 and HT-S3305 range. These setups all come with HDMI 1.4 connectivity, with all of them decoding Dolby TrueHD and DTS-HD Master Audio. Interestingly, the receiver used in the S6305 range is the already mentioned TX-SR508, which means you will be able to upgrade to a 7.1 setup if you feel the need. The S5305 is a more modest 5.1 setup, piping out 100 watts of sound. The final piece of the home cinema system puzzle is the S305 range which also offers 5.1 sound at 100w but uses a more entry level receiver. Last but not least, Onkyo has pimped up its Blu-ray range with the BD-SP308. Although it is an entry level model, it offers HDMI 1.3 (shame it's not 1.4), upscaling to 1080p, BD-Live connectivity and compatibility with AVCHD. There's also a HDMI slot on board and, again, it will decode Dolby TruHD and DTS-HD Master Audio. The TX-SR308 receiver has a UK release date of March, costing £250. Both the TX-SR608 and TX-SR508 receivers have a UK release date of April and cost £450 and £350 respectively. 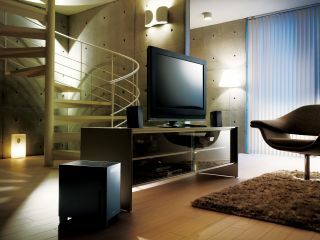 The HTX-22HDX home cinema system and SKS-22SX speaker package our out in May (£300 and £100). While the receiver/speaker packages are all out in April, costing £500, £400 and £300. Finally, if you fancy nabbing a budget Blu-ray player, then the BD-SP308 has a UK release date of May and costs £200.